Good looking game with lots of Leonardo`s paintigs and lots of fun. You can play and marvel at images of ohn the Baptist, Madonna Litta, Mona Lisa, Raring Horse, The Musician and more. Game is very easy to use, you can control everything only with mouse. 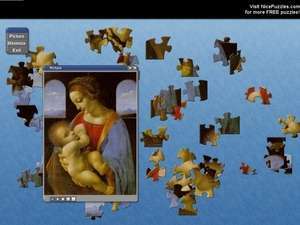 Leonardo Da Vinci Free Puzzle Game is running on every PC with Windows and contains no viruses or adware. For security reasons, you should also check out the Leonardo Da Vinci Puzzle download at LO4D.com which includes virus and malware tests. Additional screenshots of this application download may be available, too. Leonardo Da Vinci Free Puzzle Game has a presence on social networks.